Protect your investment! We are experts at cleaning the finest oriental rugs. The most important step is to check the color fastness to make sure the colors in your rug will not bleed. This will determine the appropriated method to clean the material. If there has been any colors that have run prior to us cleaning the rug, we more than likely can remove the problem. We will first remove any dry soil and dust from the rug. The rugs are then washed, usually by hand, treated for spots and stains, and appropriately deodorized for any smell or neutralized for any pet accidents. Oriental rugs are expensive. You need the best services to maintain its beauty and elegance. 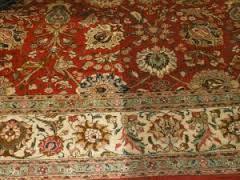 ProCare Surface Steamer offers oriental rug cleaning services that adds the former life and vibrancy into your carpet. Contact us today to book an appointment.